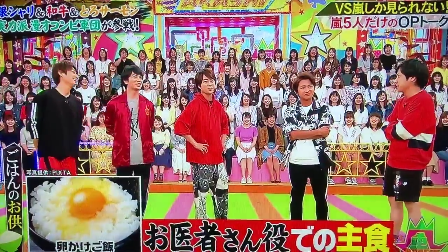 S: Well, everyone, what I'd like to ask you is... is there any food you'd usually have (mixed) with your rice? A: Kamaage shirasu (salted dried tiny sardines)! [Sample photo shown] I love shirasu. M: Like when I eat rice okazu-style. When I have a small amount of leftover rice, I'd think of what to eat with it, I always have it with umeboshi. S: During our concerts, there'd be all sorts of food prepared at the dressing room, right? We'd be drinking stuff like carbonated drinks, so there'd be carbonated drinks inside the fridge. Is the umeboshi in the fridge yours, MatsuJun? 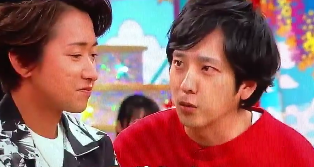 S: I'd have rice with umeboshi too but Nino-san, how about you? N: It's included in various situations (meaning: his drama scenes), raw egg on rice. M: You do love that. A: Yeah, you look like the mentaiko type. O: I do have that image, right? A: You'd absolutely buy omiyage (souvenir) of mentaiko from Fukuoka, right? O: I'd buy tons of it. S: Have we talked on TV about the mentaiko incident that happened in our concert? N: We haven't told it. S: Would you do the honor? N: When we were changing our clothes, our manager suddenly showed up and asked me, "Is it okay if I talk to you right now?" At a busy time like this, right? So I thought it was something serious so I said, "Oh, okay, what is it?" N: "About the mentaiko omiyage... How many boxes would you be needing?" 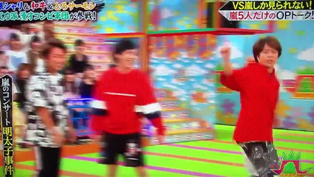 N: "I don't care about that (right now)! Let's talk about it afterwards!" O: But all of us replied, right? (Demos with a harried look on his face) "Two boxes! Two boxes! Two boxes!" running across towards the stage"
N: His reply was cool. Thank you very much for the translations. Appreciated much.